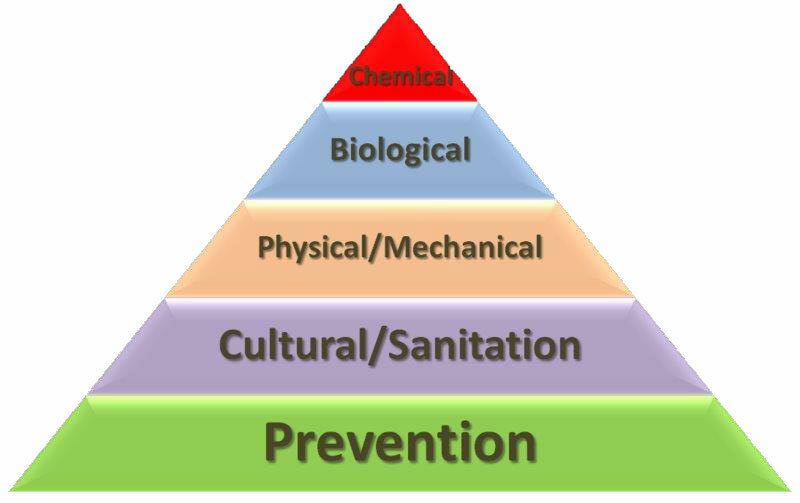 Integrated Pest Management (IPM) is a decision‑making process for managing pests that uses monitoring to determine pest injury levels and primarily uses cultural, mechanical, physical, and biological tools to minimize health, environmental, and financial risks. The method uses extensive knowledge about pests, such as infestation thresholds, life histories, environmental requirements and natural enemies to complement and facilitate biological and other natural control of pests. The method uses the least toxic synthetic pesticides only as a last resort to manage pests. The goal of IPM is not to eradicate pests, but to eliminate pest problems by strengthening and stabilizing the landscape so that conditions are more favorable for plants than for pests. By using scouting and monitoring practices for pests (insects, other arthropods, weeds, pathogens or vertebrates), actions to suppress population levels can be made in a timely manner, using a combination of the most environmentally-friendly and cost-effective tactics available. Preserving naturally occurring predators such as lady bird beetles is important in the pest management process. The IPM Program Manager will give up to 72 hours prior notice of pesticide application along with a description of area or areas that will receive a pesticide application.Pesticide applications will be cancelled or postponed if weather conditions are not favorable for application including excessive winds or a precipitation event. ***A pesticide application is scheduled at the Santa Fe Community Convention Center on Friday, June 15th at 10:00am to control Odorous house ants and Pavement ants with Niban Granular Bait; active ingredient 5% orthoboric acid. EPA Reg. # 64405-2. Application rates – 6 oz. /100 sq. ft. and 0.5 ounces in cracks and crevices. Areas to be treated are the North loading dock and West steps in the central patio using spot application and crack and crevice application. Other control methods have included sanitation and physical/mechanical control. ***A pesticide application is scheduled at the Geneva Chavez Community Center (GCCC) and the Santa Fe Community Convention Center (SFCCC) on Friday, April 20th, 2018. GCCC Pesticide application will begin at 6:00 am; SFCCC pesticide application will begin at 8:00am. Prior control strategies of pests at the GCCC and SFCCC include sanitation, exclusion and trapping. GCCC – Oriental cockroaches; interior of the large mechanical room and the exterior dock area of the large mechanical room. SFCCC – Odorous house ants and field ants; Exterior West side and exterior NE corner of loading dock. Use Rate: 2.6 Fl. Oz. diluted in 1.0 gallons water. Spot treatment and crack and crevice application. ***A pesticide application is scheduled at the Marty Sanchez golf course and MRC on playing fields turf grass from Monday, October 16, 2017 through Thursday, October 19, 2017 to control turf broadleaf weeds dandelion, plantain, white clover, black medic, knotweed, and spurge. Prior control strategies of weed pests have included mechanical removal, fertility and irrigation management, mowing height and mowing frequency. Weather conditions (wind speed, precipitation) may postpone pesticide applications. ***A pesticide application is scheduled for Friday, August 18, 2017 at 8:00 am at the Santa Fe Community Convention Administration Offices. Two offices will be treated for Odorous House Ants with Advion Ant Gel Bait. Other control actions attempted have included mechanical trapping, sanitation, and exclusion. 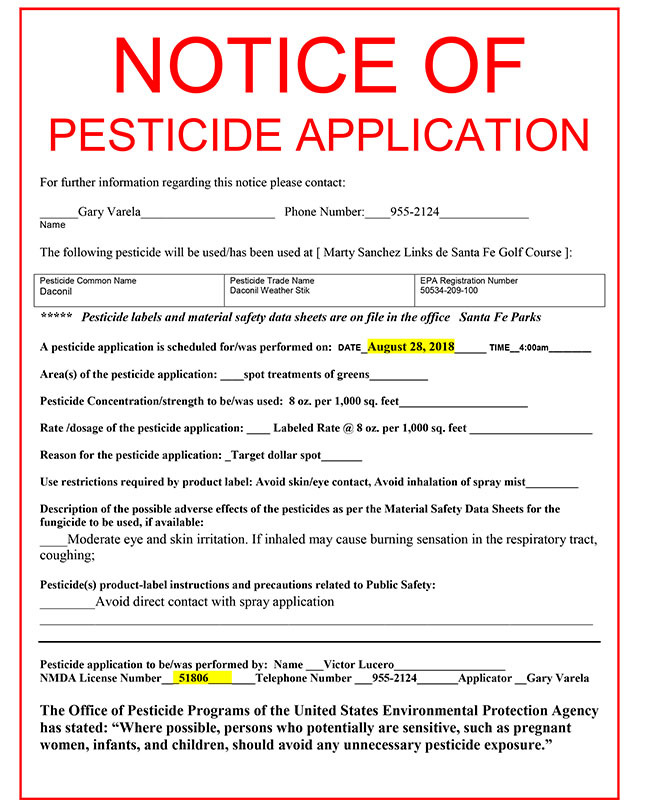 Pesticide application will be by New Mexico Pest Control, NMDA License No. 1. ***A pesticide application is scheduled for Saturday, July 1, 2017 at 4:00 am and July 5-7, 2017 at 4:00 am at the City of Santa Fe Marty Sanchez Links de Santa Fe golf course. Bunker complexes will be treated for broadleaf weeds (common dandelion, broadleaf plantain, narrow leaf plantain, spurge, knot weed) with the herbicide, Speed Zone. Other control actions attempted have included mechanical control (hand-pulling, string trimmers, hoeing). Herbicide application will be by IPM Program Manager, Victor Lucero, NMDA License number 64386. ***A pesticide application is scheduled for May 24, 2017 at 9:00 am in greenhouses 1 and 2 at the City of Santa Fe horticulture yard to treat petunias for foliar fungal mildew complex. The fungicide Bonide Copper Fungicide, active ingredient Copper Sulfate, EPA Registration Number 4-58, applied at a rate 8 ounces per 3 gallons water of finished foliar spray will be used to treat fungal mildew complex Erysiphales spp. on petunias. Other control actions attempted have included the use of sterile soil, sterile planting baskets, air and water management, and removal of infected plant parts. Fungicide application will be by IPM Program Manager, Victor Lucero, NMDA License number 64386.